In the 21st century, one of the biggest concerns that many homeowners have is how to make their homes more environmentally friendly. There are many options. Some people install solar panels on their roof, others opt for newer, more energy efficient windows and doors, and many people are beginning to realize the benefits of making their kitchen more eco-friendly. If you are wondering whether certain kitchen renovations or custom kitchen designs can help you make your kitchen more eco-friendly, below are some considerations to keep in mind. Deforestation in our century is, and will continue to be, a large problem. The amount of rainforest cleared for lumber that ends up in people’s homes all over the world is startling. That’s why many people are opting for bamboo as a replacement for natural hardwoods. Bamboo makes great backsplashes, flooring and cutting boards in the kitchen. While that Italian restaurant mood lighting might look great, the best way to cut down on the amount of energy your kitchen uses is by swapping out those old light bulbs for fluorescent ones. Fluorescent bulbs are capable of cutting your energy requirements by 50 percent. If you are thinking about other lighting options during your kitchen renovations, consider adding an extra window in the kitchen so that you can take advantage of as much natural light as possible. Another option for flooring and backsplashes in the kitchen, if bamboo is not your thing, is cork. Cork stands up well to water and is durable, making it the perfect candidate for the kitchen. It is also sound absorbing, and hypoallergenic. Many new custom kitchen designs and kitchen renovation ideas incorporate a recycling station into the kitchen layout. A recycling station is set up to receive all of the recyclables that you and your family go through on a daily basis, with separate areas and containers for different recyclable items. Adding a recycling area to your home is one of the best things that you can do to help minimize your ecological footprint. 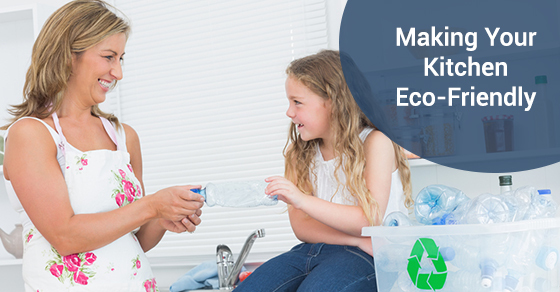 Making your home as eco-friendly as possible is a responsibility that all homeowners have. If you are thinking about a new custom kitchen design, or undertaking a kitchen renovation project, make sure you are doing your part for the environment and incorporating an eco-friendly design.